versions have been fine for me. and it's a fixed bug. | versions have been fine for me. Is it possible to set it so it's always turned off ? Thanks - I'll give it a try. 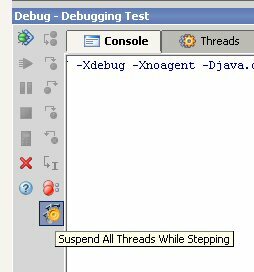 How do you disable the suspension of all thread? It's the bottom-most icon in the debugger toolbar. See attached picture. Normally yes. But the current build has a bug which turnes it on automatically on each debugger start. Will be fixed in the next build. What is that icon supposed to look like?